I found the Vice Presidential debates to be far more to my liking than the Presidential back-and-forth. I loved that Joe Biden was fearless, and that finally, finally someone called both Ryan and Romney on their bold-faced lies and wishful thinking. Okay, I could have lived without Biden's grinning, gloating, and grimacing while Ryan was painting himself into corner after corner. It made me wonder what part of Al Gore's grinning-gloating-grimacing or the fall-out from it (thanks to the rabid press and talking heads), he had missed. He fared better than Gore when it came to the press, though I must admit I never turn on FOX or right wing radio. I listened to Rush once, but I'm too delicate a creature to subject myself to that kind of abuse more than once. “Number one, I will be very specific, number one, this lecture on embassy security -- ­­ the congressman here cut embassy security in his budget by $300 million below what we asked for, number one. So much for the embassy security piece. Also, he brought up what the President had failed to: that great old 47 percent remark that Romney made to a group of fellow rich guys that was secretly recorded for posterity. 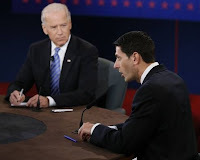 Vice President Biden had no kind words for Romney's excuses and flashed a genuine smile at Ryan as he looked him in the eyes and said, "The idea,­­ if you heard that ­­little soliloquy on 47 percent and you think he just made a mistake, then I think you're ­­--­­ I think ­­I got a bridge to sell you.” And so it went, point for point. My favorite part was when the VP was asked about his Catholicism and abortion. He answered that he does not want to force his religious beliefs into political laws. Perfect. Amazing, yes? As if we haven't been listrning!